Most parents find clipping their little one's fingernails scary and for good measure. The nails of your babies are tiny, and without a proper tool at hand, you always stand a chance of doing more damage than good. As a matter of fact, if you are not careful, you can draw blood quickly while clipping your baby's nails. There have been cases of babies getting serious infections including (herpes simplex virus) due to improper nail grooming (﻿﻿Source). However scary and intimidating it may be, grooming your baby is very important. An infant's nails are jagged and sharp. If you don't clip them often, they can scratch their delicate skin easily and cause some serious damage. Sharp nails can even cause considerable damage to the baby's eyes as well. So, the smart thing for any parent is to clip them often. But how to do it? Use the right kind of nail clippers. Thankfully, many great baby nail clippers allow you to cut your baby's nails with confidence and safety. These clippers are specifically designed for the delicate nails of the babies. That said, now all baby nail clippers are created equal. While some clippers are great at their job, some others fall considerably short. In this article, we will take a look at some of the best baby nail clippers that you can buy on the market. Why do you want special nail clippers for babies? "Why do I need special nail clippers for my baby? I can use a small scissor or a regular nail clipper and still get the job done. " Well, in theory, you can use a scissor or a regular nail clipper to clip your baby's nails. But there is a huge risk involved. Scissors are not designed to trim your baby's nails, now are they? There is every chance that while clipping the nails you can injure the baby's fingers and draw blood. Even regular Clippers are a terrible idea. They are designed to cut regularly sized nails, and if you take a look at the nails of your baby, they are anything but regular sized. Those small nails need specialized tools that are designed with their shape and texture in mind to provide the best safety. Biting your baby's nails off is also not a very good idea. As a matter of fact, the American Academy of Pediatricians warns about the potential risks of biting your baby's nails. You see, your mouth is filled with bacteria that you don't want anywhere near your newborn. You absolutely need special nail clippers for your baby if you want to clip their nails safely. What to look for in a baby nail clipper? As with most things that you buy for your precious little cherub, you don't want any run of the mill baby nail clipper. While there are hundreds of clippers on the market, picking the best one can be a bit daunting. However, you can narrow down your choices if you know what to look for in the best baby nail clippers. Well, that's exactly what we are going to look at now. Here are some important features that you should be looking for when you are deciding on a baby nail clipper. The design is one of the most important things to consider before you pick a nail clipper for your baby. The clipper should be easy to use and should have curved cutting edges for a good and clean cut. Another design component that is important is the grip. A good nail clipper will have a good grip so that it won't slip from your hands while you are in the middle of clipping your baby's nails. The material that is used to make the Clippers is also crucial. Avoid any nail clippers that are made from metals that can corrode and rust easily. There are many clippers on the market that are made using high-quality stainless steel. They may cost a few bucks extra, but thy are well worth the price tag. Clipping the nails is not enough. Sometimes, clipping can leave some edges on the nails, and an emery board can be a great tool to have to smoothen them. Many baby nail clippers on the market come with an attached high-quality emery board. You can use this attachment to gently smooth out the rough edges of the nails after clipping them. One of the best additional feature to have on a baby nail clipper is the built-in LED light. Many clippers on the market come with a LED light that is strategically placed so that it throws light on the nails while cutting them. It is a great thing to have as you can see what you are doing whether there is enough light in the room or not. Although not all clippers come with this feature, it is a good feature to have nonetheless. How to clip your baby's nails safely? Clipping a baby's nails can be intimidating for any parent especially if you haven't done if before. However, with the correct tools at hand, this can be done in no time, and with time, you will get better at it. 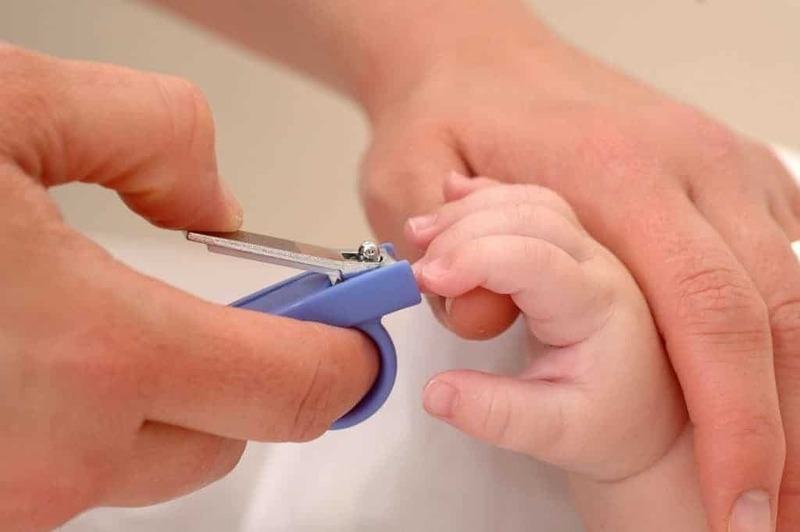 Clip your baby's nails only when he/she is relaxed: The first thing that you need to do is make sure that your baby is relaxed before you even think of clipping his/her nails. An agitated or upset baby will increase the risk of injury. Clip small: By this, I mean don't try to get a big chunk of the nail. Start out slow and clip tiny portions of the nails. That way, you will avoid clipping the skin and drawing blood. Always remember, less is always more when it comes to clipping your baby's nails. Finish up with an emery board: Always remember to file the clipped nails with an emery board gently. Clipped nails can have edges that can scratch you, baby. You can smooth them out using an emery board. Finish up by disinfecting: The last step is perhaps as important as any of the previous steps that parents forget. Make sure that you are wiping the nails with a disinfectant wipe. Once this is done, you can pat your back for a job well done! Now that you know why you need a special nail clipper and how to clip your baby's nails, it's the time for taking a look at some of the best nail clippers on the market. One of the most famous clippers on the market, the First Years Clippers get a lot of things right. In fact, the Clippers are officially endorsed by the American Red Cross, which speaks volumes about the quality. One of the best features of these clippers has to be the design. The Clippers are very comfortable to hold and feature a high-quality stainless steel cutting edge that is rust and corrosion proof. The specially designed grip features a rubberized coating that ensures a tight, slip proof grip. The shape of the clippers is also designed to be ergonomic for the parent to hold. The clippers also come with an inbuilt magnifying lens. With this lens, you can magnify the view of the nails you are clipping up to 4 times for a controlled clip. Trust me, once you use this feature, you would be a hundred times more confident in clipping the nails of your baby. Safety 1st is a trusted name in baby products, and their nail clipper lives up to the expectations. The Clippers are designed to give you excellent control on clipping your baby's nails. The specially designed grip allows for a comfortable fit in your hands so that you can clip away with confidence. One of the best things about the Clippers is the choice of the material of construction. The blades are made from 100% stainless steel while the grip is made from a high-quality plastic. The curved edges are designed perfectly to be used on the tiny nails of you baby. The Clippers come in two colors- orange and green. These are barebone clippers that don't come with any add-ons. They don't have a LED or even an emery board attachment. That said, they do a fantastic job to clipping your baby's nails. The Fridababy Clippers are one of the best clippers on the market that are designed with your comfort in mind. The Clippers sport a unique design that allows for an easy and a firm grip while clipping your baby's nails. The clipping edges are made with stainless steel that is corrosion and rust resistant. The cutting edges are designed so that they resemble a scissor's edge so that you get a more precise control of the clipping process. Another great feature of the Clipper is that it comes with an "S" shaped emery board for easily filing away any rough edges on the trimmed nails. A feature that most parents love is the safety spy hole. It is a small slot that allows you to see exactly what you are clipping. The spy hole makes it easy for you to avoid overcutting the nails and hurting the nail beds. Although the inclusion of an emery board is good, the Clippers don't have a LED light. The Solavae Grooming kit is one of the most adorable nails clipper set that you will see on the market. It comes with everything you need to give your baby a great professional manicure! The best part of the kit is the nail clippers. They are designed to be very comfortable to hold and easy to use. They feature a stainless-steel cutting edge that is not very sharp and yet not very blunt. It has an anti-slip grip that lets you clip away with confidence. Apart from the Clippers, the kit contains a scissor and a glass nail file. The best part of the kit is that once you are done clipping the nails of your baby, you can store all this equipment neatly in the egg-shaped box. The kit comes in a variety of colors from powder blue to pink. The Summer infant care kit is hands down one of the most comprehensive manicure kits that you can purchase online. The manufacturers seem to have thought through almost everything while designing this excellent kit. There are over 12 components in the kit! It contains a pacifier and a medicine dispenser, a forehead thermometer, a digital thermometer, a comb, emery boards, a nail clipper, a nasal aspirator and even a rattle. Talk about thinking things through! The main star of the kit, however, is the nail clipper. It is designed with the tiny fingers of your baby in mind. It features an anti-slip grip, a stainless-steel clipping edge, and an ergonomic design. The plastic components are safe and hygienic as well. The set comes in two colors; pink and teal. There is almost no issue with this great grooming kit. The clippers and emery boards are of high quality. However, the only gripe with this kit is that some components such as the syringe and bulb are not that great. The nail clippers and file are the star players in this lineup! After thoroughly reviewing some of the best clippers on the market, we have no doubt in crowning the Summer ﻿﻿Infant Complete Nursery Care Kit the winner of the nail clipper wars! Although some clippers came an awful close, the high quality of components and the sheer versatility helped the Summer Infant kit pull ahead. The nail clippers are great, and the included emery boards are one of the best on the market. We hope that this article narrowed your search for the best nail clippers. If you enjoyed the article, don't forget to share it with your friends and loved ones!